Weekly Photo Challenge: Beginning | Oh, the Places We See . . .
It’s only fitting that the WordPress Weekly Photo Challenge would focus on the word Beginning at the start of a new year. The word itself makes me think of many personal beginnings — plans for work, renovations that need to be done to our home, and projects that I’d love to begin (and some I’d like to begin again)! But it also brings to mind a heart-shaped piece of art on display near Smith Center in Las Vegas. 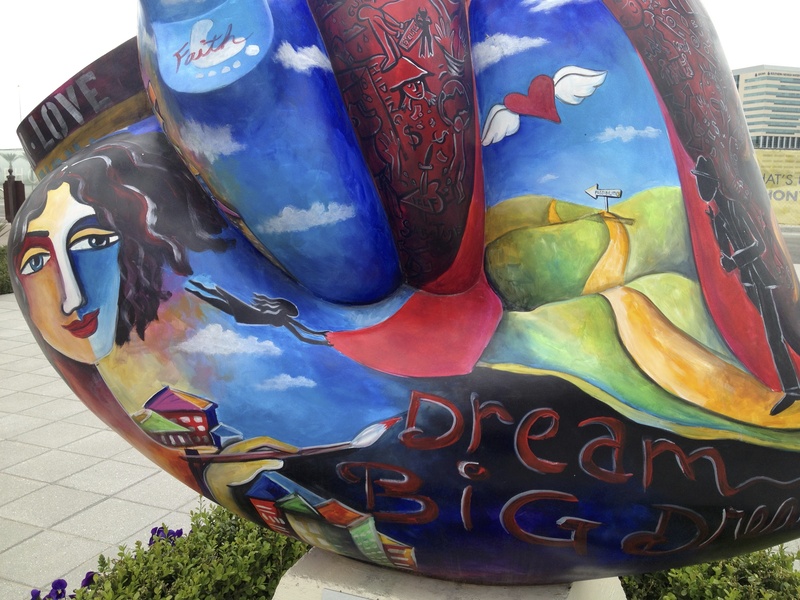 Positioned in a small park, the painted heart bearing the words Dream Big stands alongside other hearts painted by area artists to benefit St. Jude’s Children’s Hospital. The message is a simple one: We can all benefit from dreaming big dreams, especially if heartfelt resolves are involved. Best wishes to each of you who choose to Dream Big. The new year — 2014 — can be a great beginning! For more entries in the Weekly Photo Challenge: Beginning, click here. This entry was posted in Nevada, Weekly Photo Challenge and tagged Dream Big, Las Vegas, postaday, St. Jude's Children's Hospital, Weekly Photo Challenge. Bookmark the permalink. I love anything that helps St Jude….thanks for sharing this great piece of art with us. You are so right. Thanks for reading, commenting, and dreaming with me! Love the statue and an excellent choice for the challenge! Thanks! It was a fun place to visit! Pingback: Weekly Photo Challenge: Beginning (2) | What's (in) the picture? Thanks so much. I hope we get a few things done at our house. It seems we�re never caught up! Thanks! It’s an interesting little sculpture park. This was one of my favorites!